Nichole's Senior Design Team Challenge came just in time to coordinate with a sewing project I've been working on. I found some wonderful coffee themed fabric at my local quilt shop and have been working on some pretty napkins, some little coffee coasters, a basket liner and hopefully a pair of lap blankets .......some day I'll get to all that. You can see snippets of my finished napkins in today's photos. In the meantime, Nichole's challenge was to create a project that incorporates giving the gift of a hot beverage. Coffee is at the top of my list when the weather turns colder so I had a great idea brewin' in my head. Often times when I sub at the school or spend the night at a hotel, the coffee is all gone.....or non existent. For those times when you really want that first cup of coffee in the morning, I created some little coffee kits that will fit the bill. For each of my coffee kits, I used a single coffee bag packet, a single size creamer and a sweetener packet. I started off my coffee kits by punching a scalloped square of Chocolate Remix patterned paper. I chose the text background for my project today. I then stamped the coffee images from Warm Happiness using Dark Chocolate and various blue inks. I added a Dark Chocolate Vintage Button tied with Cream Twine into the center of a cocoa colored Prima flower from my stash. Next, I inked the word *coffee* from Warm Happiness onto Vintage Cream Twill using Dark Chocolate ink. I wrapped the stamped twill around medium glassine sacks that are filled with my coffee kit ingredients. A simple staple holds the twill in place nicely. I finished up my coffee kit packets with a Dark Chocolate Swiss Dot ribbon and then attached the coffee accent square to the sacks with a few pop dots. I tucked all my coffee kit packets into a wicker tray lined with my coffee themed napkins and a few coffee mugs. Next time I have guests, we can sit out at the picnic table and enjoy a hot cup of coffee. As a little gift, they can take home a coffee kit of their own. I also think these would be great to tuck into a suitcase when travelling, or keep a few in your glove compartment when on the road......or take some as little gifts when you're at a weekend crop. Just a fun little gift that is straight from the heart. Now, may I take a moment to show you a little behind the scenes action of my photo shoot? As I propped my basket and some flowers and was beginning to take photos, here comes Miss Libby. She is our smallest kitten and has used up about 4 of her nine lives in the last month or so. First, she got bit by a snake in the face and swelled up like a grapefruit. Then Eric ran over her back legs one morning while leaving for work. Then she ran under the garage door one day and I shut her leg in it. Next up, she got tangled in a volleyball net and was choking. I had to run for the scissors to cut her out. Needless to say, I have nursed poor Libby back to health each and every time she has gotten into trouble. Now she follows me everywhere and loves for me to hold her and pet her. She could not stand that I was outside and wasn't paying attention to her. So she hopped right into my photo shoot....front and center.......look at me.....why aren't you petting me? Then here comes Boots. He gets into everything and is very curious. He made his way through my flowers, sniffed into the coffee cups and pretty much made himself at home with all of my goodies. All the while, poor Libby sits patiently...looking up at me......waiting for me to pet her. 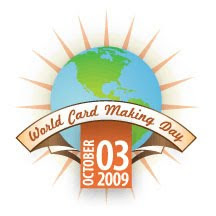 This Saturday, October 3rd, 2009, is World Card Making Day. Click HERE to join in on the blog tour....I'll be participating too with a cute card posted here on the blogaroonie! A fun day full of inspiration and sharing. I have worked very hard today for all of you who have requested more and more Christmas notebooks! These are going up in my Etsy shop as soon as I get my blog post done. Perfect little notepads for Christmas lists, teacher gifts, Secret Santas, stocking stuffers and more. I like to give these out right about now to friends...they always like their notebooks early. My Mind's Eye papers and glittered chipboard embellishments. Tied buttons and pretty ribbon snippets. Have at 'em ladies!!!!!! I'm going to take two Tylenol and read my Twilight book now!! Whew!!!!!!! Note: When these notebooks are gone, there won't be anymore like these. I'll be moving on to some new supplies. I'm gearing up for October Design Team work so I won't have anymore notebooks in my shop til the middle or last of October probably. Hello everyone, I have the rest of the week off from subbing (so far) so I'm going to be productive around the home front today. But I wanted to say hello and just chit chat for a bit. A few of you have asked why I am not posting all of my Etsy creations on the ol' blogaroonie. The answer is that I love to keep my Etsy shop full of new creations....but I don't feel like blogging every day of the month. So I create new stuff that's just for fun and goes into the Etsy store without taking the extra time to do a blog post. 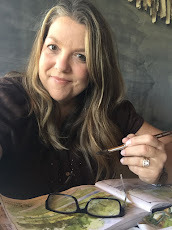 I have been taking those days when I don't blog to focus more on my family, home and other crafting ventures like quilting, sewing and scrapbooking. So be sure to check my Etsy store for lots of new cards that aren't sometimes shown here on the blog. So what have I been up to? I just finished reading the latest book in the series of The Elm Creek Quilters called The Lost Quilter. Such a good read about a runaway slave and her courageous life. If you like historical fiction, you'll love these books! Now I'm finalllllllllllly reading Twilight! Josey is finishing it up and I just started so I have a lot of catching up to do. Our goal is this: We both finish the book and then I rent the movie. Josey's already seen it. Then we read New Moon before the movie debuts in November. We're going to get a bunch of us together and go see the movie at our local theatre. I finally decided it was time to jump on the Edward bandwagon. I didn't want to miss out on these memories that Josey will surely talk about when she's grown up! We're also busy planning Jordan's 11th birthday party for this weekend. She's having 5 little girlfriends over and it's sure to be a fun time. We're going to have a nature scavenger hunt (an all time favorite and I might add that I'm THE WORLD'S BEST SCAVENGER HUNTER ORGANIZER!) We'll also have a weenie roast complete with S'mores in the timber.....and lots of time swinging in the hammock, building forts and playing in the tree house and creek bed. Good times! I've discovered Nutella. Why oh why didn't someone urge me to try this sooner in life?? I've seen it used in the cooking shows a lot, especially The Everyday Italian show on the Food Network, but have never tried it. Oh. My. Goodness.........heaven in a jar. Hazelnut flavored, thick and gooey chocolate. The only recipe I know is this: Stick spoon in jar. Lick off. Repeat. What else do you do with Nutella? I'll be googling new recipes for sure! EDIT: Here's a site that offers a couple hundred recipes for Nutella! Who knew?? Sweet potatoes. My mom and dad have bushels full, it was a bumper crop this year! I have to admit that sweet potatoes are not on the top of my favorite foods list. Jordan loves them though at Thanksgiving with the ooey gooey marshmallow topping. However.......I have found a new recipe for Sweet Potato Fries that will make you want sweet potatoes every day of the week. I'll be sharing that recipe soon on the blog. Crispy.....a little salty with other flavors mixed in.....we dip them in honey. Yummoooooooo! Can't get enough. And my mom brought over sweet potatoes that were as big as footballs, no kidding. I didn't know they could get so huge!! Okay, I think that's enough chit chat for this morning. I've got lots of catching up to do around the house since I was sick for a few days. Catch you girls later! I love this little set from My Cute Stamps called Go Green. It's got the hippest stamps featuring peace signs. Notice how the little flower center is a peace sign...the cool PEACE sentiment and the big peace sign. It's just seemed natural to paper peace the peace sign. Get it? For my paper piecing and background papers, I used fun new papers from Cosmo Cricket. I colored the peace flower, the leaves, the tiny little heart and traced the letters in PEACE with Copic markers. This is just a fun little set to play with......get creative.....let your hair down......burn your bra! All that good stuff! Have a fun day everyone! If you'd like to send someone a PEACE card, I've got some over in the Etsy shop. Thanks for stopping by!! Isn't it great that our various crafting ventures just overflow into each other? I love that one day I can be knee deep into the sewing and the next day I can create fun cards.....all about sewing. Today I've created some fun friendship cards using one of Karen Lockhart's quilt block stamps(Quilt Block I). I stamped the quilt block image onto patterned paper and colored a portion of the designs with my trusty Copic markers. By stamping on to the patterned paper, a lot of the color is in place...making for a quicker colored image. I lined the bottom of my card with 1" punched squares of coordinating patterned paper from K and Company. I finished off my cards with a friendship sentiment from Papertrey's Quilter's Sampler stamp set, some tied Vintage Buttons and a strip of twill ribbon. Hope you're having a fabulous Friday! I'm recovering from a mild case of the flu. I'm sick of laying in bed though so I'm up and at 'em.....a little bit of sewing, a little bit of card making, a little bit of reading. Hope you have a fantastic weekend everyone! Edit #3: Helllllllo again. TGIF!!! To answer a few questions.....I shop for my fabric at lots of places like my local quilt shop and from little shops I find on road trips. I've never bought fabric online before but I'm finding lots that I want so I may take that route here soon. I typically do not purchase fabric from Walmart and the craft stores as I find their fabric is a little stiff and of lower quality. Yes, that means I usually pay up to $9 bucks for a yard of fabric but the quality is well worth it. And YES, I'll be making more totes soon. They take me a while to make but I'm hoping to upload totes to my Etsy shop once or twice a month. Thank you so much for your interest!! Have a great weekend. Edit #2: The Grab and Go Bags are now sold out. Thank you if you purchased a bag...and thank you for the nice comments. I will definitely be making more bags from time to time. I love to make them and I'm sure I'll go in little sewing spurts to create more. Wanna see my newest sewing venture? Okay! In the last year I have really embraced the whole sewing thing. I got a new machine (the Baby Lock Audrey) and have just been stitching up all kinds of things. I'm almost done with my first quilt top and will be ready to assemble the quilt and get the binding on soon. I can't wait for that!! In the meantime, I take on projects like home decor items and these little gems. I call them Grab and Go Bags. I made a mini version of this some time ago and posted it here on the blog.....I got lots and lots of requests to sell them. So here goes...I've got a bigger version of my totes for you. Here's the details: The bag body measures about 9" x 9", not including the handles. Both sides of the bag have a four patch pattern in cute fabrics(all of these shown use Moda fabrics). Handles are stitched onto the outside of the bags with very sturdy stitches. Cute ribbon on each bag.....and there is one button sewn on each bag for a fun little detail. My Grab and Go Bags are fully lined with coordinating fabric. Each bag has an extra layer of thick interfacing inside also for a more sturdy lining. The bottoms of the Grab and Go Bags have a boxed bottom detail, allowing the tote to have a roomier bottom and stand up a little on it's own. And I lovvvvvvvvve picking out new fabrics. It's every bit as fun as selecting new patterned paper for cards!! My Grab and Go Bags are just the perfect size to toss in your keys, cell phone, a pen and notepad, a library book, your grocery list.......all those little things you need to grab while you're running out the door. I'm going to make one for myself and hang it on a special hook by the door. I'm always needing a little bag to take with me when I run errands or am picking up the girls from practice. This little bag is just the ticket!! I'll be uploading my bags to Etsy today so stay tuned! I just love sewing. It's relaxing because you have to take your time when sewing. You can't hurry a project. I like to sew upstairs because of the natural lighting....my 40 year old eyes require good lighting when I sew. I gather up all my supplies and keep them in baskets so that I can tuck everything away when needed. Then when I'm done I'll put my supplies away for awhile until another project calls my name. Right now I have lots of other projects on my to do list....but I need more cute fabrics. For my upcoming anniversary I have a great plan....I've paid for my husband's deer to be stuffed..or mounted......or whatever you call it.......that is a BIG present. About $400 bucks worth....get it......bucks????? Anyway, I figure if I surprise him with that for our anniversary then I can naturally count on something just as good right? It is our 15 year anniversary! So I'm planning a quilt shop hop and am going to spend some major chump change on some new fabrics. Ohhhhh, I can't wait to tell Eric about our anniversary plans. He will be SO THRILLED.....not. All you have to do though is spread the shopping out between stuff men like to do. You go to one shop........then go eat greasy BBQ.....then go to another shop.....then go to Cabella's.......then go to another shop......then go get ice cream......see my method? I can't wait! There's a new kit up in the shop. It's called Peace Dude and uses Cosmo Cricket's patterned paper and ribbon and My Cute Stamps Go Green stamp set. Lots of peace and nature going on... Here's some little square cards I made using all the kit elements plus some additional patterned paper, ribbon and cardstock. Lots of fun elements to work with as you can see below. The girls thought the kits were really fun and liked my cards I made. Doesn't it seem like all the kids say *dude* a lot? Drives me bonkers sometimes actually but probably no more than we said *awesome* fifty million times when we were kids! Hope you're enjoying your weekend! It's a beautiful evening here in our neck of the woods...we picked a few more pumpkins, Eric shot his new bow.....went for a drive to look for deer......now just winding down the weekend. Catch ya later! Karen Lockhart's Vintage Apron stamp is simply adorable. Every time I make a trip to the quilt shop, I see a different apron made up.....and tons of apron patterns. I think I'll have to buy a few patterns and see what I can whip up for my Etsy shop sometime soon. In the meantime, I've made some fun apron cards with Karen's stamp. I paper pieced the apron by stamping the image onto some Basic Grey patterned paper. I cut out the images and adhered them so my cardstock mats, stitching around the edges to add a homespun feel. I added strings of tied buttons and pretty pink ribbons. The inside of my cards read *It's your birthday...tie one one!! * I love the play on words..perfect for that friend that loves aprons! And here's another card from the blog archives I made using Vintage Apron. Boy, all this talk about aprons makes me wanna go whip up something in the kitchen. Hope you're having a great day! Last weekend was just perfect. I spent it with my family...working and playing outside in the beautiful Kansas weather. Here's Eric in the Bobcat, moving some rock around near a rock retaining wall we're building. Guess what? I got to drive the Bobcat too. I am so cool now. Really cool. And just when he thought he was done for the day, I had him move just one more little rock for me. I thought this one would make a nice bench near the garden. When that pretty maple gets gihugicly tall, we can sit under the shade while we watch our garden grow. That gate in the above photo leads to our Bridge of Terabithia (love that movie). Behind the tree line is magical world all for the girls. There's a creek, a tree house, a tire swing, a fire pit and all kinds of little stick forts built for hiding and paint ball (one of Eric's big adventures in life). I love this photo of the girls. Without knowing, they each put on the same outfit this day. It totally reminded me of when I'd dress the girls alike when they were little. It was just so much easier to shop that way because the girls were only 15 months apart. It warms my heart that they both picked the same outfit to wear...kinda like that stuff that twins do without knowing. It was getting a little hot by the afternoon so the girls and I headed to the creek. The girls love when there is running water....that means it's time to get muddy! Here's Jordan doing the *I think I'll push my big sister over* action shot. And the muddy part came soon enough. There's something about kids and mud. They just can't resist to squish their toes into that smushy stuff! And this shot of Jordan holding a worm over her mouth. Gross Jordan. Don't do that Jordan. I prefer this peaceful shot of the cold, clear water trickling over our tootsies. Oh, was it surprisingly cold.....but oh so refreshing! It was so fun to splash around with my girls. Eric told me how happy he was that I take so many photos......that way we can remember all the fun times we had once our girls are grown up and moved on.....or moved nearby hopefully. Such a beautiful day full of nothing special.......but everything that is special to me. I am truly blessed. 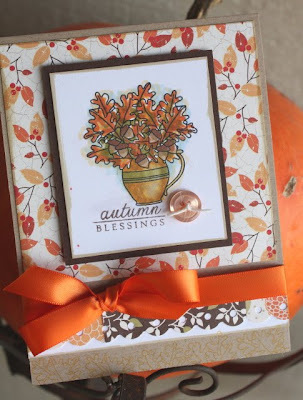 I had such a fun weekend...it inspired me to make this card featuring Papertrey's Autumn Abundance....pretty leaves, acorns, Fall colors....just like our leaves trickling down the creek....Autumn is just around the corner. 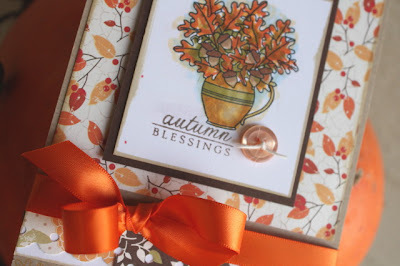 I paired my pretty pitcher of leaves up with the sentiment that reads *Autumn Blessings*....such a perfect pairing for my card. My image was colored with Copic markers in lots of Fall-like colors....oranges, reds, browns, and yellows. I finished off my main image with a Dark Chocolate cardstock mat, and a tied Vintage Button. Card base is Kraft with Autumn Abundance patterned paper and a little snippet of brown from the Green Tea Leaves patterned paper collection. My card is finished off with a pretty Orange Zest ribbon. I hope you are inspired to spend some good, quality time with your family. Nothing special...just being together...feeling blessed to be with the ones your with. Have a great weekend everyone. It's Nell Hill today with my sister and my niece.......craft show tomorrow.......and now I just found out that my friend Carmen is coming over to scrapbook on Monday! Boy, life just doesn't get any better than this. Friends and family......it's what it's all about. Who needs work? Uh, Eric needs work.....cuz I'm gonna drop some good chump change this weekend, guaranteed! Snort!! Wanna do some blog hopping? 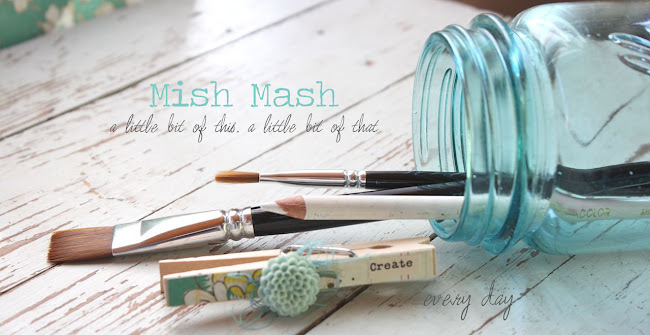 JustRite is having a mega blog hop featuring all kinds of fun fonts. And from September 17-24, you'll receive an extra 30% off all JustRite fonts. At the end of my post, I'll be listing all the bloggers who are participating today. Then tomorrow, there will be a whole other list of bloggers joining in on the JustRite font blog hop. Today I'm using the Brayton Uppercase Font Set and the small Horizontal Wood Stamper. You simply use the tweezers from JustRite to place your letters in backwards order on the wood block. Then you stamp. It's so easy to personalize a gift with a name tag or you can create your own sentiments and phrases and more! Now, you all know that I'm very practical with my stamping. I'm always using my stamps to create cards and tags that match little gifty items I like to give out to friends and family. Today I have another birthday gift to fancy up for my friend Lori Jo. She's a high school friend and now works at our same high school as the librarian. Often times, she doesn't get to leave the library and has to stay put during lunch. She has a tiny little office that doesn't offer the best accommodations for a nice lunch. So I thought I would give her one of my signature gifts of a mug, matching salad plate and pretty cloth napkin. Just the sight of her favorite barn red color will be enough to make any ordinary sack lunch seem fancy. I couldn't leave everything all plain-like though. I started with a little gift card and matching envelope. The envelope uses Jenni Bowlin papers and has Lori Jo's named stamped right on the front. Anything with your name on it is special, but to have it hand stamped.....well that's just super-dee-duper-special! I used the smaller of the JustRite Brayton font to spell out Lori Jo's name....so easy but such a thoughtful and personal touch. The inside card has a punched circle of apples from the Autumn Blessings Borders and Centers Oval set that I colored with Copic markers. I colored a full size image of the apples from the Autumn Blessings Borders and Centers Oval set with Copic markers and used a sentiment border from the same set. I cut the image out with Spellbinder's Oval and Scalloped Oval Nestabilities. I then punched holes, added black brads and tied the tag to the pretty mug with Papertrey Pure Poppy satin ribbon. For my presentation of my gift to Lori Jo, I surprised her at the library...brought in her gift..set it up just like I had displayed in my photo.....then let her see it. She LOVED it!! The first thing she noticed was her favorite color and secondly she tore into the gift card. She then promptly put the card back in the tiny envelope and retied the bow back on and set it up for display. I told ya people like to see their name on stuff! I didn't have the heart to tell Lori Jo that she is slowly turning into my mother! She re-wraps stuff like that all the time, LOL!! So remember......keep it stylish, keep it simple......and your friends and family will love each and every gift they receive from you!! And some white pumpkins...I love the variety we planted this year. I'll show you more another time. Our pumpkins inspired this card below. I colored the image while at Nichole's house..we were all playing around with the Copics. I used my beloved Vintage Picnic stamp set, using a plaid picnic basket and the pleasingly plump pumpkins for my card along with the *happy harvest* sentiment. I colored them with Copics and then fancied up my main image piece with Dark Chocolate and Orange Zest ribbon. A tied Vintage Button sits on top of the stitched ribbons. Background papers are from the Autumn Abundance and Green Tea Leaf patterned paper collections. Base card is Kraft with Dark Chocolate for the mat layer. Scallops are from a Fiskars border punch. Hope you're having a beautiful day! Fall is definitely in the air around our house. My sister and my niece are coming for the weekend and it's sure to be a grand time. I have the urge to decorate for Fall so I have to hurry up and get my house all clean first. It's rare that I have company so it's fun to get the house all gussied up. Oh and the cooking, I have lots of munchies to prepare. And did I tell you that we're going to two fun events.......Nell Hill on Friday for Mary Carol's Fall open house tour....swoon.....and the Hillsboro Arts and Craft Show on Saturday......it's been an annual event for my mom and I since I was in grade school. I think I missed one year when I was 8.5 months pregnant with Jordan. Now my sister and my niece join in on the fun. Good times around the bend! I'll be sure to take more photos of my Fall decorating and the fun times!